The iPad Pro is Apple's flagship entry into the business market, aiming to extend its consumer user base while also making the sheer mobility and versatility of the IPad Pro to extend its business usability. And in this sense, it is working, with both private companies and government agencies making iPad use an increasingly everyday tool of the office. 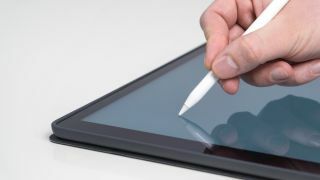 There are a number of office tools for the iPad Pro, and while it's multimedia features are especially strong, one of the simplest and most necessary is the ability to take notes and minutes of business meetings, among a range of other possibilities. An iPad for business is only ever going to be as good a prospect as the software it uses, though. Here we'll be taking a look at some of the best in note-taking software for the iPad. Whether you're a home user simply looking for a good text program, or someone who needs a pro-business typing solution, we'll try to cover all bases here. Notability, from Ginger Labs, is an excellent, general purpose note-taking app for the iOS platform. It has won multiple awards over the last several years. This app allows the user to combine multiple inputs, including typing, sketching, handwriting and photos, in a single place. It also supports annotating PDFs. Notes can be shared via email, and cloud-based services including AirDrop, Google Drive and Dropbox. Notability is available on the App Store for $9.99. For those looking for a note-taking platform that works with their iPad Pro, but also Android devices, Evernote straddles the two mobile platforms with ease. Evernote is a great app to collect multiple inputs, including images, text notes, recorded messages, and clippings of web pages - all in one file for storage and collaboration. They can then be accessed via the iPad Pro, Android, or a PC though the web browser interface for ease of workflow. Also, a further boon is that the notes are searchable. The iOS app is free, and offers in-app purchases. However, the free product is restricted to syncing only two devices, and uploads are limited to just 60MB per month. Step up to the Premium tier to sync all your devices, gain a more generous 10GB of uploads in a month, as well as the additional features of live chat support, and offline access to your notes, for $7.99 per month. Alternatively, for collaborations, there's a business plan for $14.99 per user per month with increased limits and additional features. Those who want to use their iPad Pro to easily take handwritten notes should check out GoodNotes . With the focus on handwriting, this app makes it easy to enter complex mathematics and chemical formulas that can border on the impossible via a traditional keyboard. The GoodNotes approach can also be used to annotate PDFs, plus you can search handwritten notes and convert handwriting into text. The notes are also synced via iCloud, and can be backed up to your choice of cloud providers, including Dropbox, Google Drive, or Box. The GoodNotes app is available in the iOS store for $7.99. For note-takers with needs that go beyond the basic, MyScript Nebo can handle the challenge. While plenty of note-taking apps allow text to be entered, Nebo can also easily structure notes, allowing you to add paragraphs, titles and bullet lists for organization. It also handles ‘rich content,’ such as diagrams, sketches (with different colors and pen widths), flow charts, and formulas, letting you integrate them into the document. Once completed, documents can be exported in a variety of formats, including Word, PDF, and even HTML. Nebo is available for multiple platforms, including Windows 10, Android, and of course iOS, for $7.99. Whink is an iOS app that is equally at home taking notes via handwriting, as it is with text. Whether you prefer to write with a stylus, type text, or draw with a finger, Whink makes the process as simple as using real paper. Other media can be added and incorporated including photos, diagrams with colors and “perfect geometric shapes”. Documents can also be marked up, and it supports multi-tasking so notes can be taken while reading another document (we have witnessed folks walking around with two tablets to accomplish this feat when it is not supported). Whink can be added to your iPad Pro for $4.99. The Notes app comes with all iOS devices. While some default apps just beg to be replaced by a third-party solution (Windows Paint, we’re looking at you), Notes is actually quite useful, and even dubbed an Evernote replacement, so be sure to check out all it has to offer before bypassing it. Of course, the title of the app tells you that Notes can create and edit notes. However, there are plenty of advanced features, such as adding a table, scanning a document with the device’s camera, and incorporating photos and video content as well. Additional features include Quick Draw to make it easy to add a sketch via a pencil in a blank area of the screen without having to enable draw mode. There’s also an integrated checklist creator, and shortcuts to allow including a map in a note. Notes can also be organized into folders, and even password protected. Notes can be synced via iCloud, although there are reported difficulties in using other providers, such as Google Drive. Notepad+ Pro aims to be what Notes should have been, in terms of a blank notepad you can do pretty much what you like with in terms of text, annotating, drawing, and editing images. It's a premium app priced at $19.99 (£16), but for a lot of existing customers it's worth the money. Notes Plus allows you to make handwritten notes and then convert them into text files which you can then export to other file formats, such as PDF. Alternatively, you can import PDF and .doc files. Integration options include Dropbox, Google Drive, and Evernote. Notes Plus costs $9.99 (£8). Zoho Notebook is a powerful app for taking notes, editing text documents (such as Word or PDF files), adding images or creating sketches, spreadsheets, and even including audio recordings - all in the same note file. This makes it particularly versatile, and all saved files are synced your devices in the cloud. Even better it's free, and there are no ads. OneNote may be a Microsoft production, but it's a full-featured digital notepad for the iPad Pro and other iOS devices. Aside from the fact that it has a lot of functionality - and it's free - it also integrates with Microsoft Office, which could be a big plus for a lot of people. PDF Expert isn't anywhere near as comprehensive as the above programs for working with text. Instead, it's focused only on working with PDF files, not least annotating, highlighting, or signing them. It's only a simple feature-set, but PDF Expert does it well. Although it costs $9.99 (£8), it's frequently cited as the best app for working specifically with PDF files.